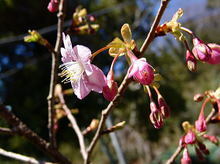 As in these days it had been very warm here in Shirahama, Sakura tree could have a Sakura blossoms. We have several trees of Sakura in our garden, but this Sakura is about 8 years old, which is near the entrance. Last year this tree had only 10 flowers, but it has a lot of buds in this stage this year. We look forward to seeing all of Sakura blossoms. By the way my son had cold from yesterday….. This entry was posted in Family, Flower, Sea on 2006年2月14日 by izusakuraya.